Held every mile track record from one to 50 miles in 1904. Won the first AAA national points championship in 1905. Won the 1914 LA to Phoenix Cactus Derby. Finished second to DePalma in the 1914 Vanderbilt Cup. Brought Indianapolis-built Stutz racer home fifth as the highest finishing American entry in the 1914 Indy 500. 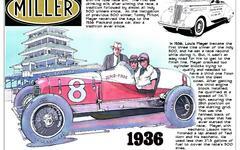 Won four races at the Indianapolis Motor Speedway. Barney was the only major figure in the sport to continue to race from 1902 through World War I. He not only survived, but prospered. Much of this material came from Barney's scrapbook, which was not well organized. I will continue to sort through the content for better presentation. As a point of interest, the only biography on Barney Oldfield is William Nolan's "Barney Oldfield, The Life and Times of America's Speed King," available at Brown Fox Books.